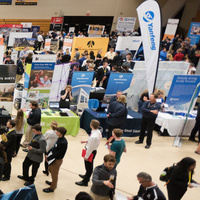 The Michigan Tech Career Fair is an excellent opportunity for students to network with hundreds of companies visiting our campus. Visit the SDC for a chance to meet with hundreds of Industry Representatives interested in helping you with the next phase in your career! View the list of employers attending.